Cry Baby was established in the USA in 2010 and has become a popular alternative to extensions, tints and strip lashes. With the semi permanent curl and lash coating technology you can now have the long lash mascara look for up to 2 weeks at a time without the daily application. What is Cry Baby Mascara? 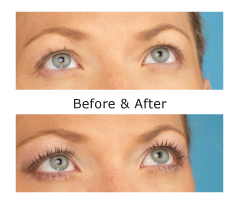 Cry Baby semi permanent mascara is a procedure that curls and coats lashes with our proprietary lash coating. Cry Baby is custom mixed by you for every client and adds volume, length, curl and colour to lashes, is 100% waterproof/smearproof and lasts up to 2 weeks, if not longer. Tints fade. Extensions fall out. Strip lashes aren’t moisture-proof. These treatments are often expensive and monotonous to apply and maintain. Cry Baby mascara is the answer to all these problems. It’s ideal for active lifestyles as well as special events like weddings and vacations. Better still, it can be offered at a fraction of the cost of extensions through your business at around £35 a treatment. You can also offer your clients the Cry Baby nutritional mascara, for that extra added volume or simply to use between treatments. Why train with ABX Cry Baby? Here at ABX we offer some of the best courses available and believe that with our high CPD course and with our continuous after-training support we can ensure you feel confident and able to complete endless beautiful eyelash treatments. We are always on hand to give advice, answer questions and give feedback on your work. In salon training is offered at an additional charge. Cry Baby semi permanent training is a half day training course with a maximum class size of 6. We keep numbers small so you receive a very high standard of personal attention and tuition time. We ask you to bring along a model for the training which means you are actively learning for the full duration of the training course and not having to waste your valuable time being a model for another student. We also offer in salon training for 1 - 6 students at a time, provided all students are from the same business. In salon training means no travelling costs and no early starts for you or your staff. All training packages come with the Cry Baby Professional kit included. We are proud to offer you tried and tested products which meet the highest standards to ensure you can give your clients the natural looking, longer, darker lashes they dream of.